We specialize in vacation homes, vacation condominiums and other vacation properties. Thank you for your interest in June Lake Accommodations’ rental program. Selecting the best rental management company is a very important decision. A wise choice will provide you with years of enjoyment; maximize your financial returns and peace of mind. Choosing a company that is not service oriented, lacks focus, is disorganized and has a antiquated marketing plan may jeopardize your valuable real estate investment, cause the loss of thousands of dollars in revenue as well as create unnecessary expenses. We appreciate your consideration of June Lake Accommodations as your property management company. Please don’t hesitate to call or stop by our office. June Lake Accommodations makes every effort to ensure that our guest’s expectations are consistently exceeded. We accurately represent our properties and help them select properties that fit their requirements. We also furnish them with the confidence that, no matter what unit they choose, they will check into a clean, comfortable, well maintained unit. We immediately respond to any needs or concerns, while providing friendly professional service. The internet has become a critical marketing resource for reaching potential guests globally. Our web site is consistently top rated on all major search engines. As a cutting edge company, June Lake Accommodations’ website, JuneLakeAccommodations.com provides guests with extensive and up-to-date information, professionally photographed units and the resources to help plan the perfect June Lake vacation. Our web site enables millions of potential guests to conveniently view your property and streamline the decision making and booking process. June Lake Accommodations was founded on the simple principal of specializing in both June Lake Accommodations Rentals and long term rental business. Another key to our success is that we exclusively represent high quality and well maintained properties. Our use of innovative systems, cutting edge technology and dedication to detail, honesty and integrity is sure to earn your trust and respect. June Lake Accommodations also offers mid and long term lease management. This service is beneficial to property owners who want consistent income for a specific period of time. Term leases are also a great way to continue income stream during slow seasons. 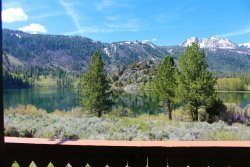 June Lake Accommodations handles all details of the rental including credit and reference checks, lease preparation, legal aspects, move in and move out inspections, cleaning, rent collection, maintenance and advertising of the property. We take care of all the details so that you have a hassle free experience and peace of mind. June Lake Accommodations provides detailed monthly statements generated by our state of the art, cutting edge reservation program. These statements include rental activity and income, itemized expenses, and occupancy statistics. Property owners can also use their own private access code to view rental activities in real time, any time. For your security and peace of mind, June Lake Accommodations is licensed and registered with the Calif. Bureau of Real Estate. Lynn Morton is the owner and Broker of record. All rental income generated is deposited into and distributed from a secure Trust Account.